Home » Sphinx. 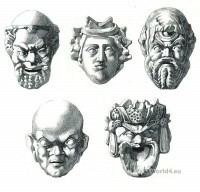 Ancient Greek mythology. The Sphinx was considered a demon of destruction and doom. 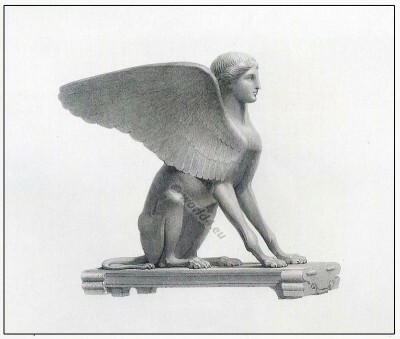 The figure of a Sphinx (1). The head is that of a female with a mild and agreeable expression of countenance; the hair is parted in front, arranged at the sides in wavy masses, and collected into a knot behind. The form of the body much resembles that of a female greyhound, but the claws are perhaps longer and sharper, and the tail is that of a lion; large expanded wings issue from the fore part of the shoulder blade, and the breast which is animal, not human, is furnished with feathers. 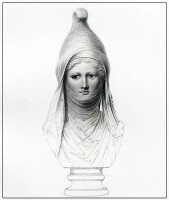 This figure is well executed, the forms are elegant, the lines graceful, and well arranged to give the idea of its having acted as a support to some weighty object. There cannot be much doubt that it must have formed part of the base of a magnificent candelabrum, to which it was attached by means of a strong square projection from the back, concealed within the wings. The manner in which it was inserted in the candelabrum to which it originally belonged, may be learned by reference to a bas relief among the Terra cottas belonging to this collection. The sphinx is here represented in precisely the same attitude, in which that animal appears on one of the gold coins of the Emperor Augustus. It has been much injured, the upper parts of the wings, that portion of the legs which is supported by rests, not represented in the plate, and all the exterior of the plinth are modern. This sphinx was found by Mr. Gavin Hamilton, in the year 1780, in the ruins of the villa of Antoninus Pius, near the ancient Lanuvium. Height 2 ft. 4| in. 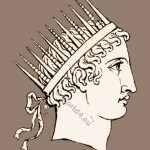 (1) The Sphinx (Greek Σφίγξ “strangler”) or Phix was in Greek mythology the daughter of the monster Typhon and Echidna and therefore a sister of Hydra, Chimera, Kerberos, and Orthos. It was considered a demon of destruction and doom. The sphinx was represented by the Greeks as a winged lion with a woman’s head, partly as a woman with breasts and paws of a lion, a snake tail and bird wings. 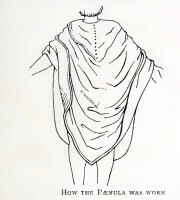 Ancient Greek costume. Female flute player. Ancient Egypt hairstyles from various periods. This entry was posted in Ancient, Ancient Greece, Mythology and tagged Ancient sculpture on 8/16/13 by world4.